Want to visit one of the oldest sites in the US dedicated strictly to public recreation? In addition to it’s open spaces, natural greenery, gardens, and paths, it contains San Diego attractions, museums, several theaters, restaurants, gift shops, and the world famous San Diego Zoo! The zoo is home to more than 4000 rare and endangered animals representing more than 800 species! It’s an association dedicated to conservation where visitors can view exotic animals in authentic environments. Come and view the giant pandas, koalas, reptiles, and many more interesting species! Coronado Ferry Landing is the perfect San Diego Attraction for a day trip! Enjoy its art galleries, shops, fine and casual eateries, waterfalls, and the city’s best skyline view of downtown San Diego. Stroll along through eclectic shops filled with memorabilia, shells, sportswear, and tons of other gifts! Try the delicious French/Mexican fusion cuisine or sample the taste of Italy at the fabulous II Fornaio! Rent bikes, enjoy free vessel docking, cast your line, or just relax! 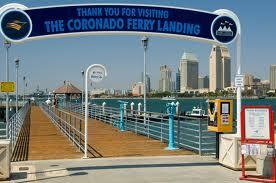 The Coronado Ferry Landing is the perfect place for recreation! If you’re interested in touring all of the most famous San Diego Attractions including the Coronado Ferry Landing, check out the 90 minute San Diego Seals Tour. 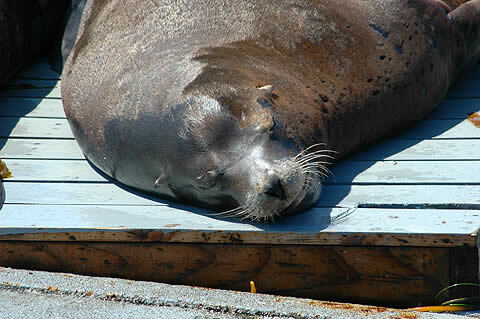 The Seals team has researched San Diego Labor Day 2012 Events and come to the conclusion that the best way for you to experience America’s Finest City is to combine the Festival of Sail and a San Diego Seal Tour. We recommend taking the Seal Tour in the morning so you can see many of the different sites that San Diego has to offer, breaking for lunch at the Seaport Village, and then walking over to the Festival of Sail at the North Embarcadero Marina Park. If you are really adventurous, you can purchase an additional ticket for the Tall Ships Cannon Battle starting at 2:30pm. The Seaport Village and Seal Tour departure point are basically in the same spot and the Festival of Sail is only 1 mile away. 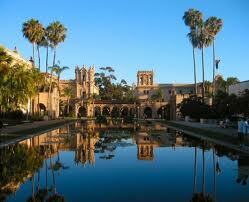 Check out the details on both San Diego Tourist Attractions. See the best of San Diego from land and sea on this 90 minute narrated adventure. You’ll see San Diego from the harbor as well as cruise by some of the coolest sites like the U.S.S Midway, Lindbergh Field, Shelter Island, and the Star of India. The Seal Tour is fun for the entire family and has received the Trip Advisor Certificate of Excellence several years in a row including 2012. 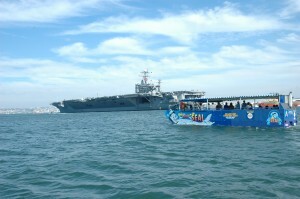 Click this link to learn more about famous San Diego Attractions and the Seal Tour. Check out the largest tall ship festival on the west coast with the annual Festival of the Sail presented by the Port of San Diego and the Maritime Museum. This San Diego Labor Day tradition offers limited tickets for the Cannon Battle, but it is sure to be a magnificent experience. You’ll board the tall ships and sail into the harbor for a historic cannon battle. If you don’t want to participate in the Cannon Battle, there are plenty of other arts, crafts, food vendors, and historic sites to see during the festival. Whatever your plans, we hope to see you enjoying the holiday in beautiful San Diego! You never know what you will find in the San Diego Bay! Our San Diego harbor tours are pretty adventurous. On most days we see our good friends the California Sea Lions basking in the sun, the occasional air craft carrier (or two!) 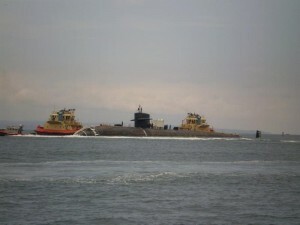 but its not often that encounter the most elusive member of the US Navy, the submarine. At the entrance to San Diego Bay is the Nuclear Powered Submarine Base. As you can see by the photos, this one is being parked by two C-tractors, or tug boats. We can’t tell you the name of the sub, because, the Navy doesn’t want you to know who they are. What we can tell you is that it is a Los Angeles class nuclear powered attack submarine. 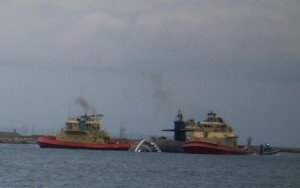 San Diego is home to several submarines including the the USS Hampton, USS Jefferson City, USS Asheville, USS Topeka, USS Helena, USS Salt Lake City, USS San Francisco, USS Portsmouth and USS Albuquerque. Los Angeles class subs are the backbone of the United States submarine fleet. They are 362 feet long, home to a crew of 133 and can travel up to speeds of 35 knots. They are often found in Tom Clancy novels, including The Hunt for Red October. We suspect there was something special about this particular sub due to the added security in the form of a Naval security boat and Coast Guard security boat. Posted in Things to Do in San Diego | Comments Off on You never know what you will find in the San Diego Bay! A great way to “sea” San Diego…on land & in the water! Sea lion sleeping in the San Diego Bay. Posted in Things to Do in San Diego | Comments Off on A great way to “sea” San Diego…on land & in the water!